Mentalist's Guide: Nightclubs is available for the first time in almost a decade. It is book two in B. Thomas' series, Cold Reading for Profit . 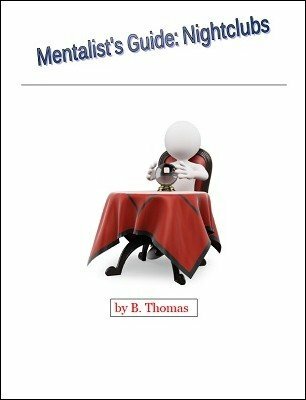 Originally mentalist and radio psychic B. Thomas only sold this at his lectures and had a limited run among inner circles of professional mentalists. This series has been among the top 10 Must Have books on Cold Reading among pros. B. Thomas shows you how to market yourself successfully in nightclubs, using tools and techniques he used to build a successful career behind the microphone as a radio psychic. Thomas was heard on radio station all over the United States - and developed a successful private intuitive reading practice as well. This is a great follow-up to The Ultimate Guide to Coldreading . In this second volume, B. Thomas goes behind the scenes and breaks down the easy way to get your foot into the largely untapped world of performing in nightclubs. For many years Thomas supplemented his radio career with performing in nightclubs throughout the U.S. He also used it as a way to promote his psychic readings. Whether you perform as a mentalist, or just a psychic entertainer, palm reader - or just a magician - Thomas puts forth concrete methods to get booked into the successful world of nightclub entertaining. The super-simple easy way to get our foot in the door. The ONE question that will increase your odds of being booked. Covers promotional items to drive results. Includes word-for-word transcript of what to say to get booked. How to effortlessly follow-up - with no stress. How to prospect or mine for gigs! How to increase profits once you're in the door. How to get the club to promote you. Covers several types of shut-eye reading techniques. Includes Press Release form and transcript of phone sales calls. 1st digital edition 2015, 30 pages.